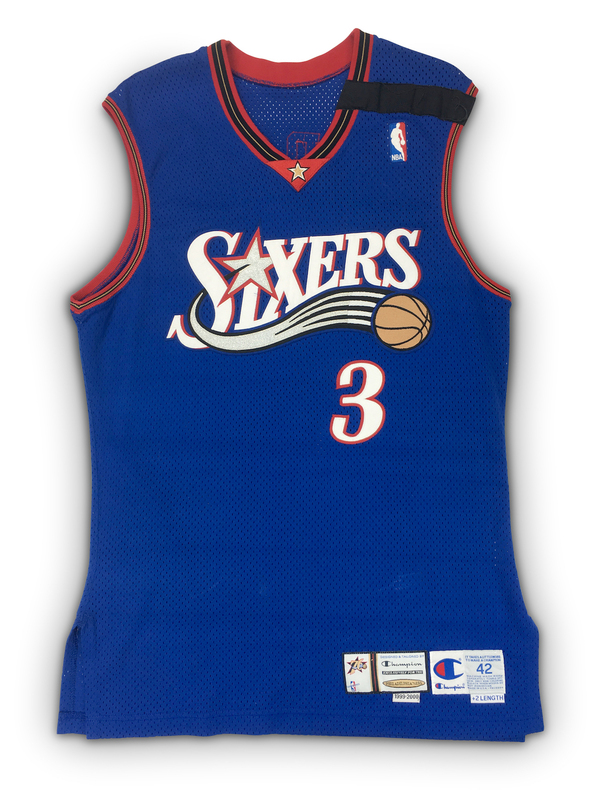 This is one of very few known photo matched Allen Iverson game worn jerseys and the only one in this rare blue alternate style. 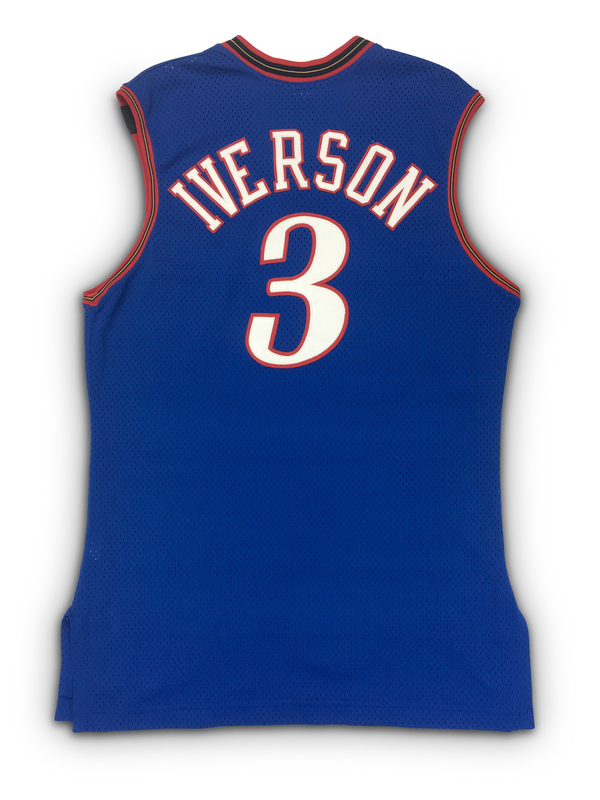 Allen Iverson led the NBA in scoring four times and has his No. 3 retired by the Philadelphia 76ers franchise. 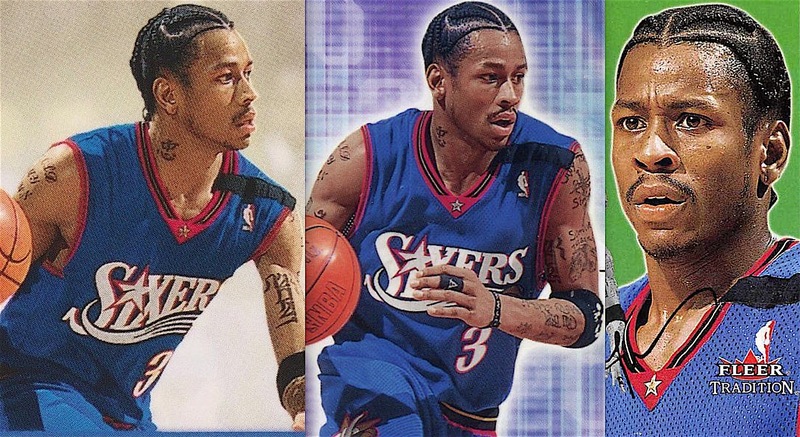 Iverson was inducted into the Naismith Memorial Basketball Hall of Fame in 2016. 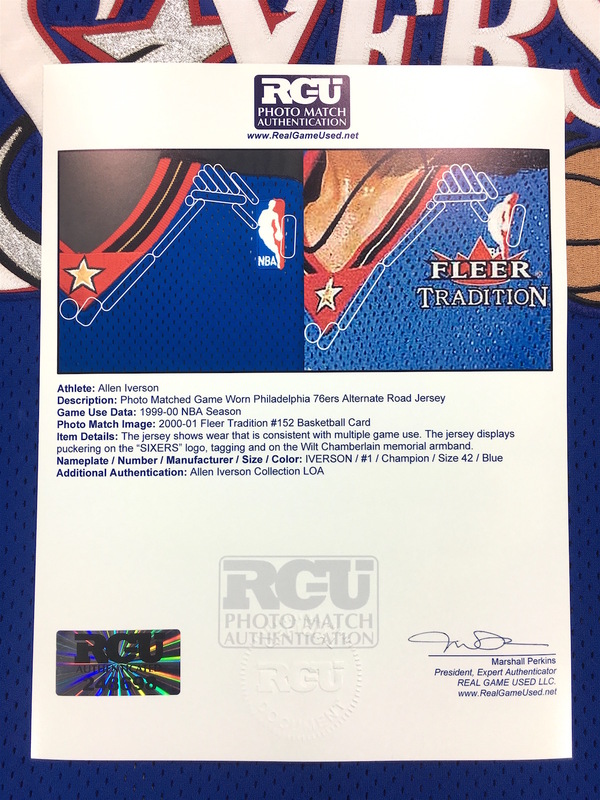 The jersey is conclusively photo matched to the 2000-01 Fleer Tradition #152 basketball card. 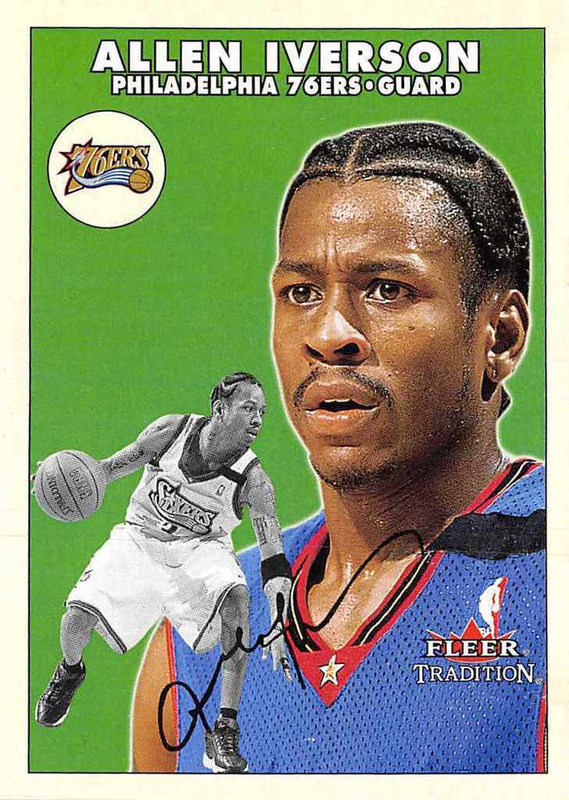 The jersey is also seen on a number of basketball cards and youtube highlight videos from the 1999-00 NBA season. 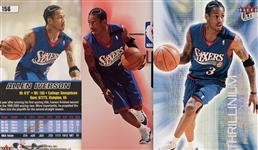 The 76ers only wore the blue alternate jerseys approximately a dozen or so times during the 99-00' NBA season and it appears that Iverson was issued two blue alternate jerseys. There is this jersey with the wrinkled arm band and number "3" that is higher on the front and much higher on the back and then there is the second jersey that is seen with extremely low numbers on both the front and back which can be seen on Getty versus the Lakers on March 31st 2000. 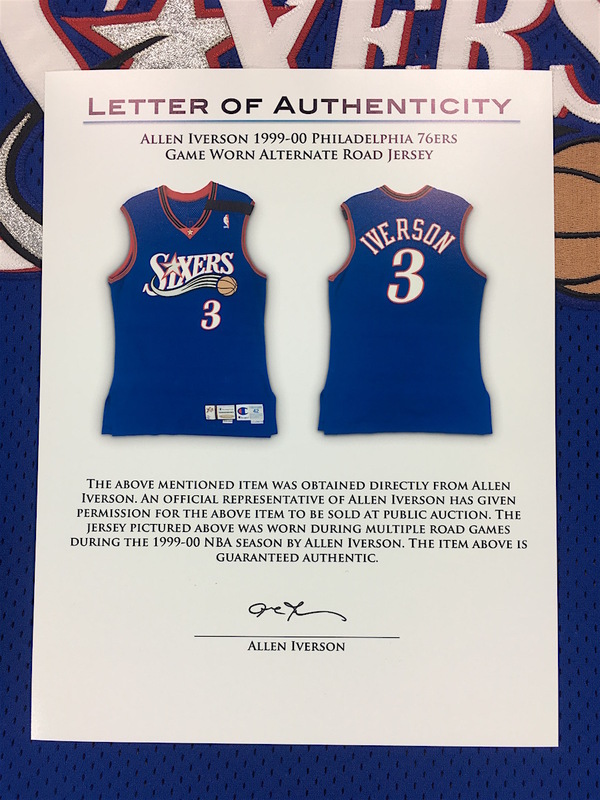 The iconic photo matched jersey featured here displays convincing game use with loose threads and puckering on the manufacturer's tag and the Wilt Chamberlain memorial armband. The wear on this jersey is consistent with multiple game use. Authenticity: RGU Photo Match LOA, Iverson Player Collection LOA.